Manila, Philippines - A total of 1,301 out of 13,618 test takers of January and March 2014 National Qualifying Examination for School Heads (NQESH) known as Principal's Test successfully hurdled the examinations, the Department of Education (DepEd) and the National Educators Academy of the Philippines (NEAP) officially announced results through Memorandum No. 53 s. 2014 released on Thursday, May 8, 2014. In an updated report released today, May 10, 2014, a total of 1,261 have passed the test in the national level and list of 40 passers from Region 8 (Eastern Visayas) was added. The masterlist was arranged alphabetically by PR (90 and above). From the total list of passers, TheSummitExpress made a tabulation to get the top 10 passers. A total of 25 examinees were included in the top 10. Isidro C. Catubig from Region 8 entered the top 10 highest places (6th place). 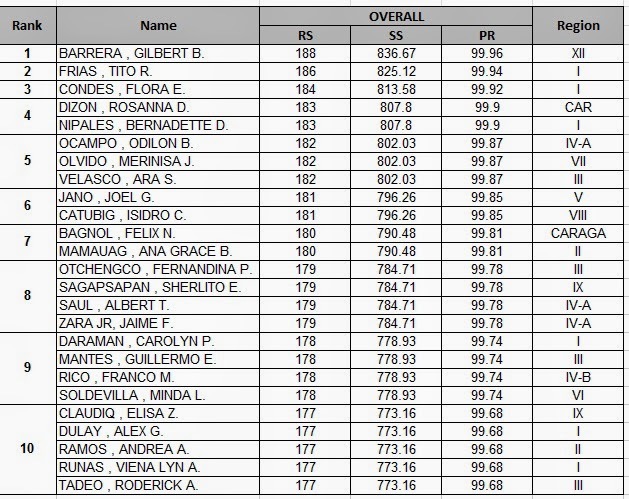 Gilbert B. Barrera from Region 12 topped NQESH 2014 with 99.96 average score. It was followed by Tito R. Frias of Region 1 with 99.94 score. The Principal's test was originally scheduled last December 8, 2013 and has been rescheduled to January 12, 2014 to give applicants sufficient time to cope with the succession of natural calamities especially those in the Visayas who suffered from a powerful earthquake and super typhoon Yolanda. NQESH in Region 8 was only conducted last March 16, 2014. 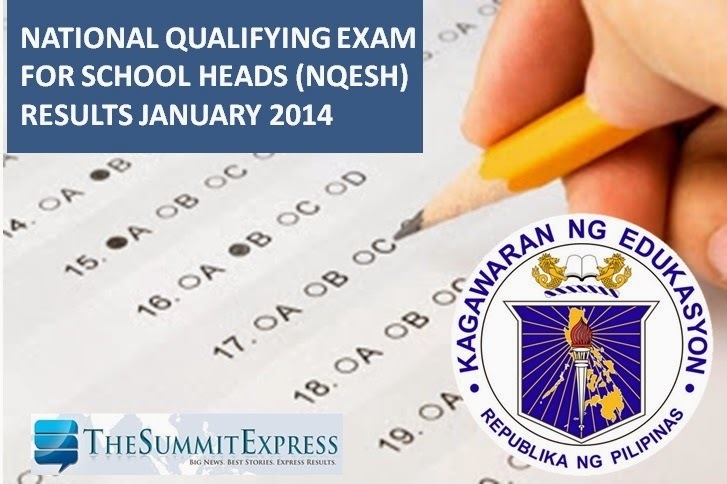 View the full list of 1, 261 national passers for NQESH 2014 on this page. Here's the additional list of passers alphabetically arranged for Region 8. 1 APACIBLE , MAROVEN A. 2 BADILLA , ALUDIA N.
3 BARSANA , GERALDINE C.
4 BATO , CLAIRE C.
5 BETONIO , GREGORIO P.
6 BINGCO , RAMIL P.
7 BOCO , MARIA RIZA C.
8 CABADSAN , ROCHEL G.
9 CALIXTRO , TARA O. 10 CATUBIG , ISIDRO C.
11 CORDAÑO , BERNARDITA C.
12 DAGA-AS , DORA D.
13 DAGAMI , JOELMA I. 14 DECIO , LEOVEÑO D.
15 DELA CRUZ , AURELIA A. 16 DELA CRUZ , IMELDA D.
17 GADOR , ADONITO S.
18 GALBAN , VALENTINO D.
19 GARIANDO , MELBA S.
20 GERUNDIO , AIRENE A. 21 JABONETE , LUCITA B. 22 LABAREÑO , MA TERESA O. 23 LAPIDARIO , SABINA A. 24 LAROA , EVANGELINA B. 25 LIM , CARMEN R.
26 MABANGUE , MELISSA N.
27 MAQUIMOT , MARIA LANIE A. 28 MERCADO , EVANGELINE C.
29 MORALDE , EDSIL P.
30 NEDIRA , EMMARIE N.
31 NUNGAY , ROMIE B. 32 ORAPA , EDITHA E.
33 PAYOT , ALPHA . 34 PERNIA , MICHAEL V.
35 PUNONG , MARIA NANCY B. 36 RAIZ , MARIO R.
37 SANTIAÑEZ , CHERYL P.
38 ULTRA , XAVIER M.
39 VERTUDAZO , ROEL R.
40 YU , GLENDA L.
Education Secretary Armin Luistro said that individual Certificates of Rating will be released through the respective regional offices in due time. In addition, he further said in a memo that requests for re-checking of examination papers shall not be entertained by the Department. Similarly, applications for additional points attributable to the Veteran's Value Point Privileged for daughters and sons of duly recognized War Veterans shall not be apply. Like Us on Facebook and Follow Us on Twitter to receive updated and original information for NQESH examinations. You may also subscribe to our RSS Feeds or Feedburner.